Specialized Solar Systems popular mid-level 5kVA 18-24kWh off-grid solar system. 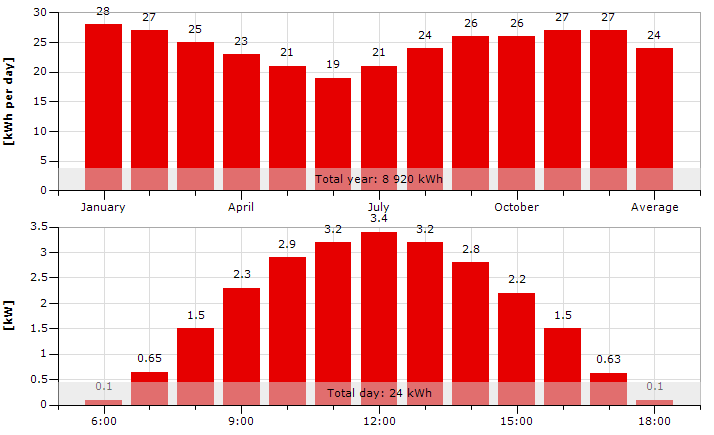 Generating a daily average of 24kWhrs with a battery storage that supports 18kWhrs of daily electrical energy usage. Our popular mid-level off-grid residential solar system designed by Specialized Solar Systems. Using superior quality solar components, this off-grid solar system will supply our customers with a daily average of 24kWhs of solar-generated energy electricity. It includes a battery storage capacity that supports 18kW hours of daily electrical energy usage directly from the battery before reaching a 27% Depth of discharge (DOD), therefore maximizing the batteries lifespan. 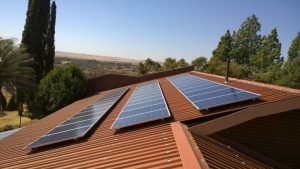 This solar system includes a solar module (PV solar panels) array which will generate an average solar yield input of 24kWh/day using a 4500Watt solar module array calculated in George, South Africa. Our solar modules have a 10-year manufacturer’s product guarantee and a terrestrial 25 year an average of 80% solar yield. 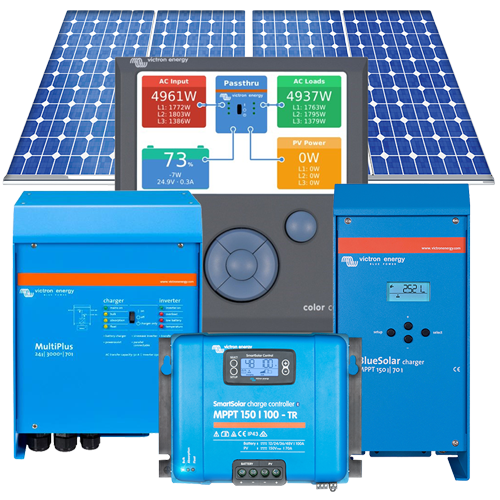 The solar system includes an array of 1380Amp 10-15 year Lifespan, 2V Millennium Deep Cycle Batteries with interconnecting cables. These batteries will have the capacity in storage at 18kWh’s usage per day, to cycle your system at 27%, thus maintaining system efficiency and battery lifespan. Please note that actual cycle ratios may vary from installation to installation depending on system use. During daylight hour’s an off-grid solar system runs off PV as Primary, Battery as secondary. Includes a BMV-700 Precision Battery Monitor: The essential function of a battery monitor is to calculate ampere-hours consumed and the state of charge of a battery. Ampere-hours consumed is calculated by integrating the current flowing in or out of the battery. In case of a constant current, this integration is equivalent to current multiplied by time. A discharge current of 10A for 2 hours, for example, amounts to 20Ah consumed. 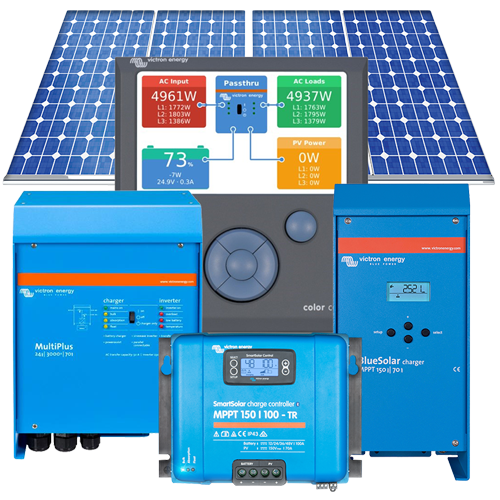 All Specialized Solar Systems battery monitors use a powerful microprocessor and are expertly programmed with the algorithms needed for precision monitoring. The main output provides a powerful charge to the battery system by means of advanced ‘adaptive charge’ software. The software fine-tunes the three-stage automatic process to suit the condition of the battery and adds a fourth stage for long periods of float charging. The adaptive charge process is described in more detail on the Phoenix Charger datasheet and on our website, under Technical Information. In addition to this, the Multi Plus will charge a second battery using an independent trickle charge output intended for a main engine or generator starter battery (trickle charge output available on 12V and 24V models only).